Learn how to smoke food cheese, fish, meat and more! Sadly we will not be running courses in the foreseeable future. We run fun and practical hands on workshops from Castle Court, near Shap. The one or two day programmes both involve eating fantastic home-smoked food and are ideal for anyone with an interest in learning how to smoke foods at home and offer you an insight into the history and theory as well as the practical methods for smoking food. The courses focus on 'home food smoking' and help you to get the best out of a home smoker. You will learn about the different ways you can smoke food at home and even how to make your own smoker! We are able to suggest places to stay nearby - B & B's guest houses, camp sites and hotels all within a few miles. One Day Course - On a one day course you can expect to smoke about 14 different types of food using seven different types of smokers - teaching you to both hot and cold smoke. You will smoke your own lunch and then sit down at the end of the day and taste everything you have smoked, with a glass of bubbly! You also go home with a goodie bag of your smoked food. The one day course is £159. Two Day Course - On a weekend course, in addition to everything we do on the one day course, we have more time for cold smoking so we smoke a side of salmon which we will also show you how to bone, prepare and slice. We will teach you to make sausages and you can make your own-recipe sausages to smoke. We will then take you fishing to catch your own trout for smoking on day two! The two day course is £265. One Day Courses at the Wild Boar - We also run our smoking courses at The Wild Boar, Windermere. Book in for a wonderful winter break on a special rate at this lovely hotel with its log fires, oak beams and amazing food. Smoky Jo's will be there to teach you how to both hot and cold smoke a variety of food on a number of smokers. Instead of tasting the food at the end of the day, dinner is included in this course. Participants are invited to a huge and scrumptious feast created by the Chef out of all the food they have smoked that day - and usually a few extras! This is an experience not to be missed and if you are having a weekend away with other non-smokers they are invited to join us for this meal. With choices of poultry, meat, fish, cheese, vegetables, shellfish, eggs and even nuts to smoke there is something for everyone. However many days you spend with them one thing's for sure - you will not go away hungry, or empty handed. We have been teaching the art of food smoking since 2006. 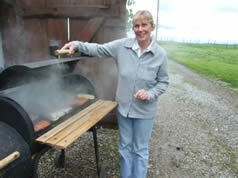 Rosemary on a Smoky Jo's course trying her hand at smoking!